With the Garmin StreetPilot 2610's touch screen and remote control, entering and retrieving information has never been easier. Perfect for both business and vacation, it's turn-by-turn routing and voice prompts get you where you're going accurately and safely. The Garmin StreetPilot 2610 also features a large, easy-to-read screen, built-in maps, and everything needed to download additional map detail and look up points of interest and addresses in seconds. Garmin StreetPilot 2610 has been discontinued. Accessories, spares and parts are still available for your StreetPilot 2610. Garmin have raised the bar for portable automotive navigation with the Garmin StreetPilot 2610. This capable navigator offers everything you want in an automotive navigation system - automatic route capability, voice prompts and a large color display - for much less than built-in systems. The Garmin StreetPilot 2610 now includes a number of new and exclusive software features. Do you want to find the most efficient route for deliveries or sales calls? Users can enter a series of destinations, and the StreetPilot 2610 will automatically sort them to provide an efficient route. ‣Road Segment and Area Avoidance Would you like to avoid traffic tie-ups or roadwork? Users can specify areas and road segments to avoid when calculating routes. ‣Find Nearest on Route Are you running on empty? This time-saving feature allows users to limit searches for gas stations, restaurants, etc, to upcoming points near a route. ‣Adjustable Road Class Preference How about taking the road less traveled? Users can adjust preferences for major, medium, and minor road categories. The Garmin StreetPilot 2610 is powered using the external speaker with 12-24 volt adapter cable or A/C power adapter (both included in purchase). The Garmin StreetPilot 2610 also offers WAAS-enabled support to ensure the highest degree of GPS accuracy. Looking for accessories and spares for the Garmin StreetPilot 2610 view them all here. All parts are genuine Garmin product and specifically designed for use with the StreetPilot 2610 sat nav. Question: I have a streetpilot 2610 which is in serious need of an updated map. I only require UK mapping so I assume this is possible to buy? However, I understand it is an SD card which is installed in the device. I use the PC based map to create routes and insert way points but can you tell me if it is possible to install/transfer this updated map into the pc to enable this feature. 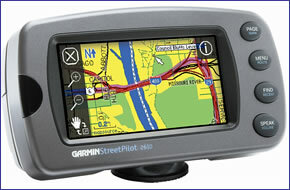 Answer: The Garmin StreetPilot 2610 predates the Garmin City Navigator NT map series available on SD card. It is therefore NOT compatible. From memory, mapping for the StreetPilot 2610 was supplied on CD-Rom. We have no CD-Roms for this discontinued sat nav. An internet or eBay search may yield a seller? We don't know how to create routes and insert way points on the StreetPilot 2610. Do you have a question about the Garmin StreetPilot 2610? Submit your question via our contact page. ‣Power: 12 volt, cigarette lighter.